Frat boys locked out of the American flight. They're out. American flight, United flight; teams discuss which would be the better choice. Fratboys - one of 'em worked in the airline industry. So they think they know best. Anita/Arthur seem to be bringing up the rear. They don't seem to be too worked up about it. Terence/Sarah were the only team to take backstreets - used to the area so they think they know fastest way. A couple of teams pass each other at high speed on the freeway. Andrew/Dan don't want to be passed. Aja is telling Ty to take the carpool lane. "Trust me it's much quicker!" She gives Ty directions to the parking area of the airport. She's concerned she doesn't see a TAR flag anywhere. There is a marked entrance to the counter. Are Aja/Ty at the right counter? Or the wrong one? Anyway ... They're the first teams. Here comes a huge group of teams. They dash in and out of each other's paths, toward the queue. Andrew/Dan "like idiots" went to the wrong counter. Hippies bringing up the rear for real. I'm missing a lot because it's moving so fast! Ty finds out from the clerk that their flight supposedly arrives 3 hours ahead of United. Frats are told: Sorry guys, it's full. The other teams had already gone to the United counter. Frat boys acknowledge they made a mistake. 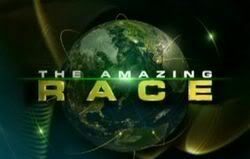 Nick & Starr and Ken & Tina make the first alliance of the race. Map shows the flights bypass Miami and Chicago. In Brazil, the first wave of teams arrive a half hour late because of delays. Mark & Bill get the clue in first. Frats walk slowly to the United section. "We made a mistake." Phil: In Salvador, teams will make their way through city streets. Find this sandwich shoppe, where teams will find their next clue. Mark & Bill and Terrence & Sarah take the first funicular. Terrence & Sarah meet Indio first and have to go to a military base and spend the night! Terrence & Sarah in first. Terrence & Sarah sign in at the military base first. Nick & Starr leapfrog over Mark & Bill, but both sign in for 9 am. departure. First flight arrives first, but only by about 90 minutes, versus the scheduled 3 hours. So teams realize they must hurry. CLUE, Mark/Bill: Become a barista, old school style. Phil: Teams must wheel a traditional vending cart to Praca De Se, for their next clue. The gay divorcees have an unconvincing confessional about how they'll do what it takes to win or summat. Terence/Sarah and Nick/Starr, followed by Ken/Tina, all getting Barista clues. Things fall off carts in the city's cobblestone streets. Of course, the items must be put back on the long carts. So somebody has to take charge of keeping items ON! Ken/Tina running through streets without a bump. Go by taxi to the 1910 Mililtary Base. Phil: They'll spend the night under mosquito tents, sign in for 3 morning departure times, 9:00 am, 9:30 or 9:45. Second wave of teams are now in Brazil. It's a race and Anita says the title of the episode. Ken & Tina are 4th at the military base, but still make it for the 9 a.m. departure. Aja & Ty are fifth and will leave at 9:30 a.m.